Articles Why Do You Ride? Through our business we have talked to thousands of people over the years. Firefighters and teachers, doctors and lawyers, students, chemical engineers, truck drivers, people in the military serving our country. We’ve also talked to people all over the world. From Europe to the Middle East, Africa, Australia and New Zealand. People from all walks of life. All these different people with diverse backgrounds from all of these different countries with one thing in common: their love of horses. 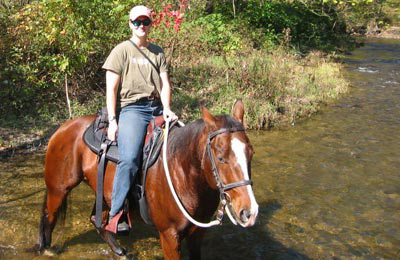 The majority of these people have a love of the outdoors and the horse is the perfect companion to help them get to places that they would never have the energy to get to on their own. I remember so many endurance rides the night before the race, sitting around a campfire after dinner with an adult beverage in my hand, listening to the sounds of the night mixed in with the horses quietly grazing. Very peaceful. For other people their horses are the thing in their life that kept them sane. Busy lives demand so much from us. Work, deadlines, commitments to family and friends. So many things coming from all directions to stress us out. For these people surviving the work week is only accomplished by knowing that soon they will be able to escape on their horse. On the trail they don’t have to answer anymore phone calls or email. No more Facebook or YouTube. Just head on out and leave that world behind. Still others like to compete with their horses. Whether it’s chasing cows: team penning, sorting or roping, endurance or competitive trail, dressage or hunter/jumper. These people love a challenge. It’s them against the world with their best friend by their side. We’ve also had a few customers that had terminal illnesses. One man, the day after talking to me, drove all the way up from Texas with his horse to get measured. He had been thinking about getting a new saddle for years and kept putting it off. His doctor gave him less than a year to live and he wanted to spend whatever time he had left with his horse. For me personally, when I went through cancer back in 2008 my horse was my salvation for getting through 7 month of chemo. It didn’t matter how bad I felt, as soon as I got on Happy Jack and headed out on the trail I knew I could survive this. Our horses are amazing animals. They are so patient with us. We could make a thousand mistakes with them while we are training and they forgive us. 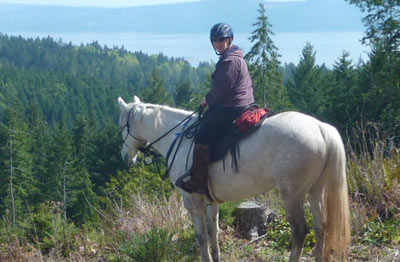 I like to ride in the mountains of the Gifford National Forest in SW Washington state. Riding up to the base of Mt. Adams through mountain meadows makes the climb worthwhile. The smell of the mountain air, the beautiful mountain foliage, the alpine ponds/waterfalls and the solitude are what attracts me to this area year after. 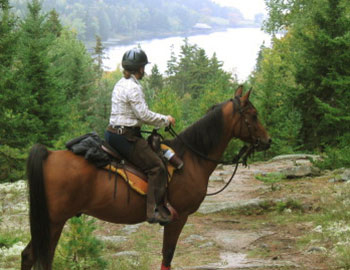 I used to backpack this country but at age 66, traveling via horseback is the way to go. Plus, you see so much more from the back of a horse!